Tree Murder in La Grange, and Tree Topping. A recent amputee looks forward to a long, hot summer. The reader is asked to remember that the year is 1939. "Tree Murder in La Grange"
There's a report coming out of Austin, printed in some of the dailies [note plural] and reprinted in full or in part in some of the neighboring towns, which puts the town of La Grange in an unfavorable and incorrect light. It is with reference to the city's removal of trees and limbs which are considered to be dangerous. 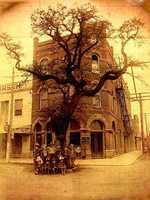 The daily press story read in part: "City authorities have ordered the massive oak trees standing in and near the streets to be cut down; and many of them have already been cut, despite the vehement protest of the citizens, women's clubs and other groups. Apparently every one of the historic trees which so much impress visitors to La Grange have been marked for "murder"..."
Exactly three oak trees have been removed. One was on the edge of the street, its trunk a mere shell and its limbs rotten,a constant menace to the safety of traffic and pedestrians alike. Another was almost in the middle of a street intersection, badly decayed and constituting a hazard to traffic. The third was on the edge of a street in a grove of several trees, consisting chiefly of a trunk with little foliage, and leaning dangerously over the street; once removed it was never missed. 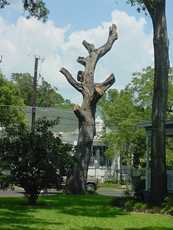 All other trees removed were hackberry trees which were so diseased that they were a constant menace to safety, and most were removed at the request of the property owners in front of whose homes the trees stood. There is one other oak that the city expects to take out. It also is in a grove along the side of a street and extends low over narrow bridge which makes it dangerous. 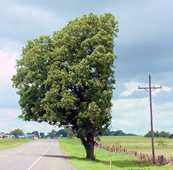 The highway department has been asked by the city to remove three other oaks that are in the highway. Another is to one side of the highway opposite a deep drainage ditch which allows but little space for passing of cars. All three trees are in poor condition. However if the highway department believes that they are not hazardous, the city is willing that they remain, but it expects a statement to that effect from the highway safety engineer. Many trees have "been marked" alright, but for trimming, not "murder." Work on most of them has been completed. On others, dangerous limbs have been removed, and workmen will return later to apply the finishing touches. The city's trees were untouched for several years. Last year a limb fell and crushed two cars. A jury held the city guilty of negligence in not removing the limb and the city was out of [sic] $435.00. It immediately made an inspection of all trees and ordered removal of dangerous trees and limbs. Not fully understanding the city's plans, at least two organizatrions compalined to the council or the committee in charge. There never has been a "vehement protest." Most of the complaints have been cleared up and, on a whole, the people of the city appreciate the fact that the council is not acting to injure the city, but in its best interests. Our thanks to A.C. of Austin for sending the original clipping. "...a bad haircut that can kill." La Grange's Muster Oak: "heathier than it was thirty years ago." 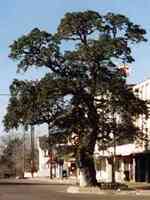 La Grange is one of Texas' "Tree-in-the-Street Communities" and is also home to the "Muster Oak" - one of Texas' more famous trees (that didn't involve a hanging). Thanks to excellent professional care, the Muster Oak is today thriving on the NE corner of the La Grange townsquare. Indeed, it's healthier than it was thirty years ago. In general, the overall care of La Grange's trees is exceptional, however, sometimes questionable decisions are made. "Topping" trees is a drastic and totally unnecessary practice. Why is it done? Because people have seen it done since they were children. There has to be a reason for doing it - right? Tree topping is a hold-over from the same era when the Navy instructed its sailors (should they find themselves in shark-infested waters) to splash around and make as much commotion as they could. Another parallell would be the old practice of bleeding someone. "Grandpa's looking a little anemic - let's take a couple of pints of blood - that'll fix him right up." Homeowners should not model their tree care after the practices of those companies that keep utility lines clear. Those companies work on a year-round schedule - and (if you can keep a secret) - they couldn't care less if every damn tree in Texas died - they'll just move over to Louisiana. While some tree species (pecans and sycamores) tolerate the deplorable practice better than others, this doesn't mean that it's good for them. Relatively short-lived ash, hackberry, chinaberries and Chinese tallow trees - widely considered weed trees - are extremely tolerant. The trimming of desirable trees should be done in the fall or winter when they are dormant. Still, every spring hundreds, if not thousands of trees in every community will be cut back just as the sap is flowing. Yes, the trees will probably survive - but so might your grandfather if you cut off an arm and/or a leg. One thing is for certain - both tree and grandfather won't be getting any healthier because of their unwanted surgery - and while your grandfather might cut you off from his will - your tree will just quietly suffer a long drawn-out death or get infected by some exotic beetle or virus (people who top trees seldom seal the cuts they make). Independence, Kansas (through it's cable TV station) is educating the public with a televised message that tells their citizens to not top their trees - and finishes up the PSA with the memorable phrase: "Think of it as a bad haircut that kills."